Upon his retirement, former Air Canada President Gordon McGregor wrote that “certainly no 20 years in the history of aviation, and probably no 20 years in the future, will show such a succession of basic changes…as did the period of 1948-1968.” He was not exaggerating. During this time period, airlines moved from propeller-powered aircraft to jets, but the rapid changes encompassed more than just machines. There’s a reason, after all, that McGregor titled his memoirs The Adolescence of an Airline. Like all teenagers, TCA grew in fits and starts through the 1950s and 1960s, had draining conflicts with its guardians as a Crown Corporation, and, most importantly for this series, learned how to communicate with women. 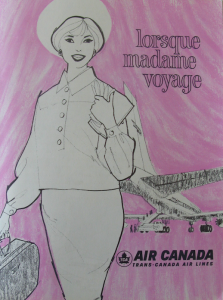 In the first two postwar decades, women navigated technological air travel networks through leisure and labour; in both roles, mid-century Canadian women appeared as savvy, technology-minded users of air travel. From the 1949 inauguration of TCA’s advertising department, officials recognized the “major role” women played in driving leisure spending and catered to them with strategies such as publishing in women’s magazines, depicting female children, and emphasizing honeymoon travel. 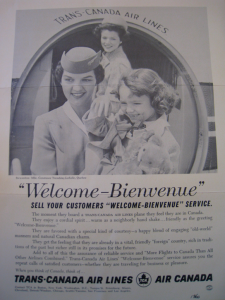 By the 1960s, TCA was tracking a discrete “Women’s Market,” where female consumers were believed to exert considerable “influence on the use by male [family] members…of air transportation.” But it wasn’t just their family influence that made Canadian women ideal consumers; they also moved through the system as travellers themselves. Material aimed at women not only outlined how to book a ticket or pass through customs, but also which clothes to wear while flying (knits and tweeds,) and how to tip at various destinations. Most importantly, it celebrated their air travel abilities, since “today’s smart women are taking to the air!” At TCA, images of the “angel-idiot”—a term coined by interwar advertising agent Frances Maule describing the popular depiction of women as presiding serenely over technology while being dumbfounded by it—were less popular than images of women exerting control over their leisure time. Even TCA’s “Business Man’s Approach” to advertising was directed at wives and secretaries, as few businessmen ordered their own tickets. Women are repeatedly shown speaking to airline agents and even disparaging the foibles of their male travel companions, painting them as both the best fliers and also the best travel-decision-makers. This combination of airline labour and airline performance extended to other traditionally female positions, including reservation agents. 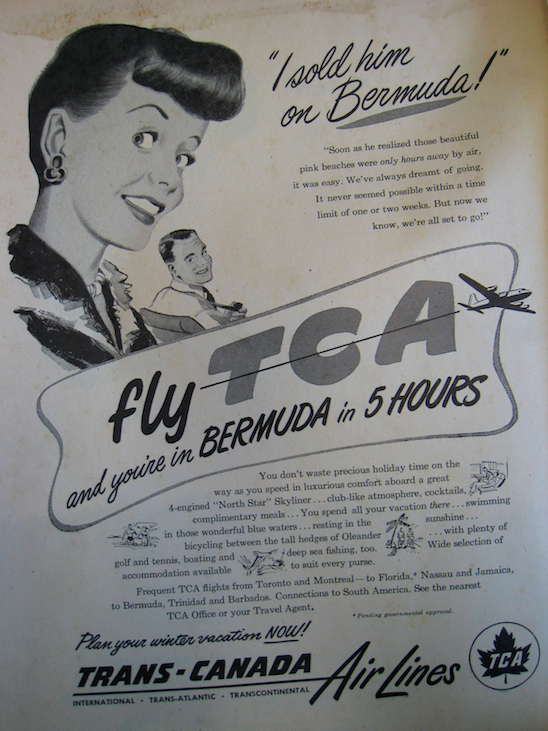 Using increasingly complex technological networks, including the world’s first computerized booking system, they were the ultimate gatekeepers of TCA’s service. 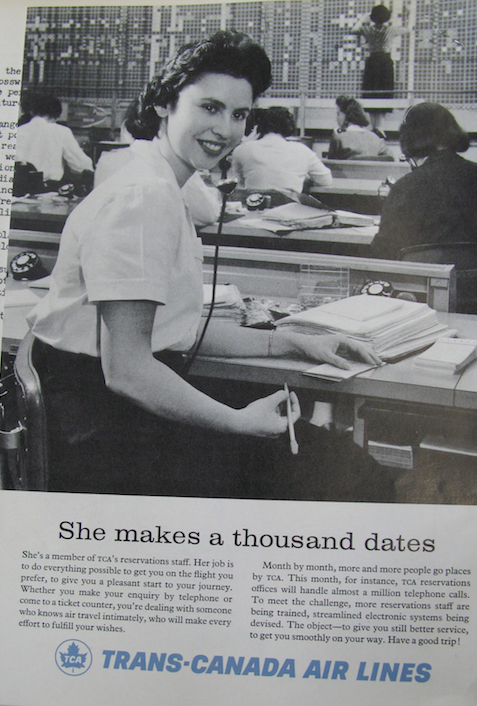 The technological skill of these women was emphasized, suggesting that potential travellers were “dealing with someone who knows air travel intimately.” Portraying working women in advertising material “symbolizes efficiency and friendly service,” according to TCA officials; the duality of labour “efficiency” and performative “service” was attributed exclusively to female airline staff. 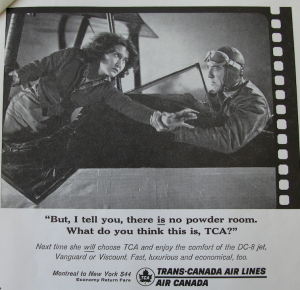 Whether accumulated though leisure or labour, women at TCA were depicted as having an understanding of air travel infrastructure, ordering pamphlets, booking travel for their bosses, their families, or themselves, or even seeking employment with the airline. As perhaps “angel-geniuses” rather than “angel-idiots,” midcentury Canadian women knowingly presided over air travel networks through their body-work and leisure decisions. Blair Stein is a doctoral student in History of Science, Technology, and Medicine at the University of Oklahoma. Her dissertation examines the co-construction of climatic identity and aviation mythmaking in Canada. 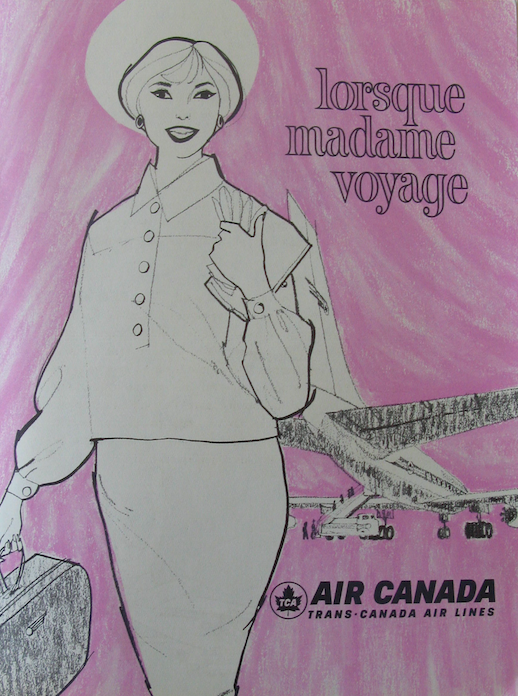 Gordon R. McGregor, Adolescence of an Airline (Montreal: Air Canada, 1970), 181. Advertising News, 20 October 1949, Air Canada Collection, CASM Archives, Ottawa. 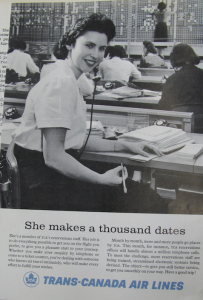 Advertising News, 6 October 1961, Air Canada Collection, CASM Archives, Ottawa. “Ladybird, Ladybird, Fly Away Home,” 1958, Air Canada Collection, CASM Archives, Ottawa. Julie Wosk, Women and the Machine: Representations form the Spinning Wheel to the Electronic Age (Baltimore: Johns Hopkins University Press, 2001) For more on Maule, see Jennifer Scanlon, Inarticulate Longings: The Ladies’ Home Journal, Gender, and the Promises of Consumer Culture (New York: Routledge, 1995), 190-195. For the American context, see Kathleen M. Barry, Femininity in Flight: A History of Flight Attendants (Durham: Duke University Press, 2007). Advertising News, 9 December 1957, Air Canada Collection, CASM Archives, Ottawa.